Toon's Tunes : Beautiful, beautiful Ireland: here's your virtual tour. Beautiful, beautiful Ireland: here's your virtual tour. I don't know how many miles I drove that weekend, I dare not count. 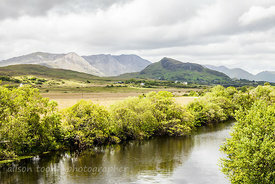 The hills and mountains of Connemara are so beautiful, I was in tears. Thinking of how desperate the people must have been, to have to leave this land. I now understand why you might become maudlin, longing for this home, when you've crossed the ocean to a cold and grey city with no green and no mountain and no heavy horses in sight. While I have known many exiles, whether through war, or politics, or loss of homeland, or economics, or just sheer wanderlust (indeed, you can count me in that last category), I think this was the first time that I truly understood what the loss of homeland might mean. I left my heart behind each time I turned a corner in the road, and found and lost it again with each and every valley, mountain, river and rock-strewn beach. On the Sunday, driving through The Burren's stark yet bountiful land, down narrow roads no wider than the little car, noticing each and every turning point or slight widening of the walls, in case a bus, car, tractor or horse came the other way; yet I met almost no-one, just some windswept horses grazing in the warm rain. People in the city (Dublin) worried about the weather. It didn't matter. It was just right. Grey and green go well together. There were tourists at the Cliffs of Moher, and yet they seemed inobtrusive. Cliffs of that scale do that to you. Yes, they are people at the top. The cliffs really are that high. For a long time, I wanted to visit the Outer Hebrides, because I imagined them like the Ireland I found. I think I was already dreaming of Ireland. Ireland, I will return. You borrowed my heart. I may just allow you to keep it.